The return trip from this vacation went by quickly thanks to good music and good company. About 5 hours into the 17-hour journey, I picked up a copilot in Salt Lake City and we spent the rest of the drive trading off shifts at the wheel. It sure was tough to leave behind the beauty of the mountains and especially the comfort of cooler temperatures. 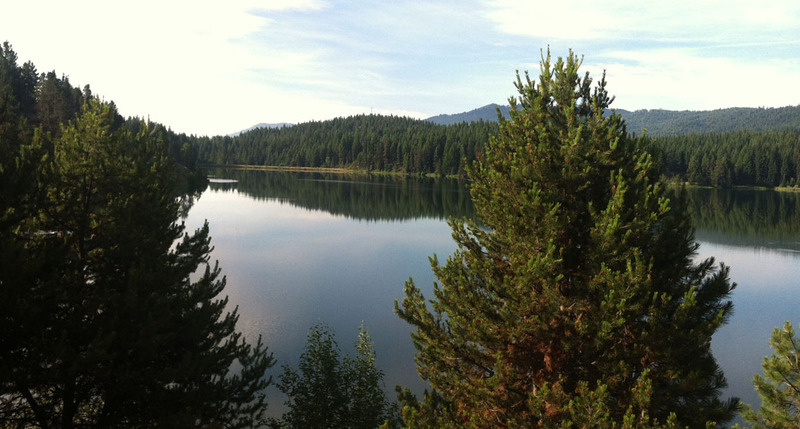 My 3-mile run on Saturday morning along the lake in McCall was surrounded by scenes like this. 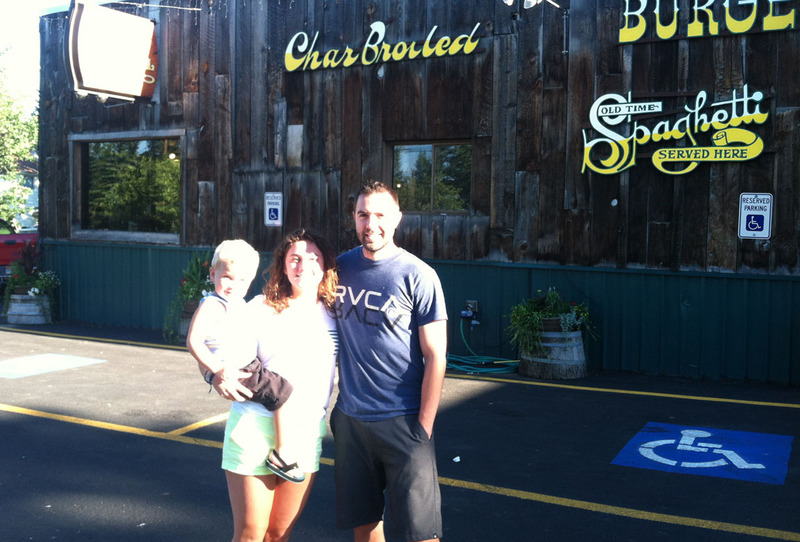 We spent the day lounging on the deck and doing a little antique shopping in McCall. That evening, we celebrated my niece’s birthday at a restaurant called Lardo’s. If you can get past the name, the place really does have quite a bit to offer! I headed south on Highway 55 after dinner and spent the next 105 miles winding through the Boise National Forest next to the beautiful Payette River. 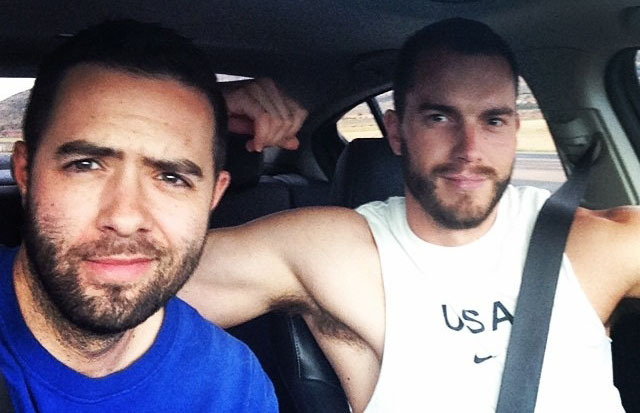 From Salt Lake City, my friend Jeremy hopped aboard and we continued the rest of the journey together. 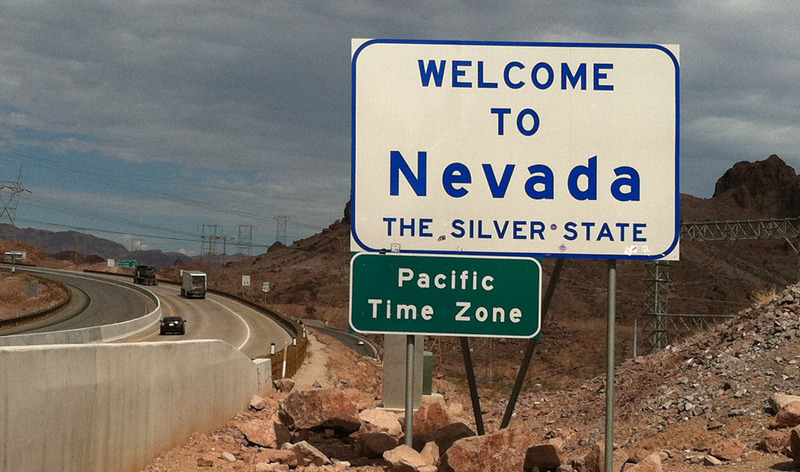 Having originally intended to spend the night in St. George, Utah, we decided to press onward. Black storm clouds on the horizon had other plans for us: Within 5 miles of entering the Virgin River Gorge on Interstate 15, traffic came to a standstill due to construction delays, and the clouds began to unleash. The construction and adverse weather conditions were further complicated by much-heavier-than-normal holiday traffic. The delay in the Gorge cost us about 30 minutes, and then the slow-moving traffic elsewhere on I-15 in torrential downpours cost us even more. By the time we arrived in Las Vegas, we were exhausted and ready to call it a night, so we did so. 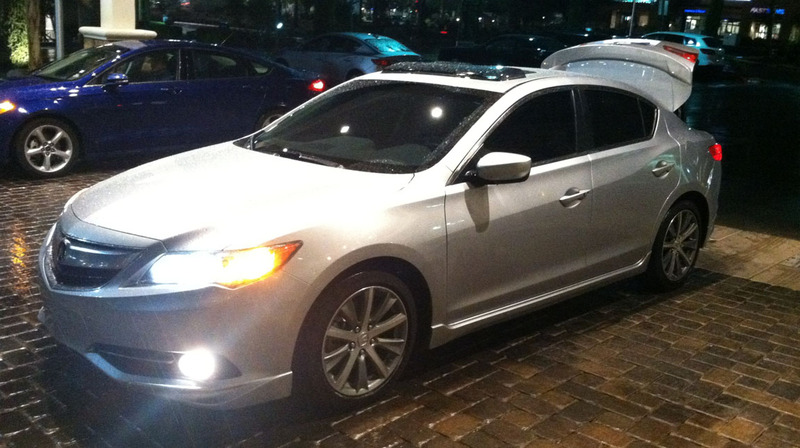 I pulled the rain-soaked ILX into the Hilton Garden Inn in Henderson for a late night check-in, anxious for a fluffy pillow and a good night’s sleep. On Monday morning, conditions were much more suitable for road tripping. We made time for a pit stop at the Mike O’Callaghan – Pat Tillman Memorial Bridge. The bridge, completed in 2010, is better known as the Hoover Dam Bypass Bridge. Before its construction (which cost $240 million), traffic was formerly routed OVER Hoover Dam. To walk across the bridge is a bit unnerving if heights are of concern. The span covers some 1,900 feet and looms 880 feet above the surface of the Colorado River far below. But the view of the dam from there is, dare I say it, “dam” good. 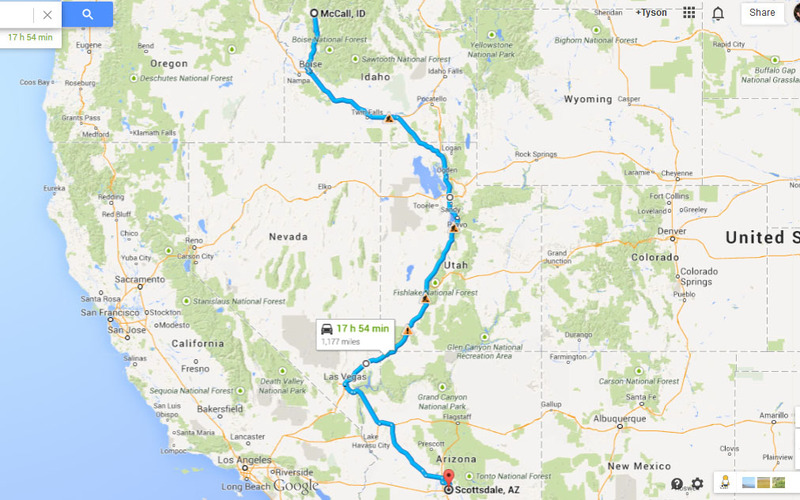 The rest of our drive was an easy one with a quick fuel stop in Kingman, Arizona and then a few hours of desert two-laners on Highway 93 on into the Phoenix area. The closer we got to Phoenix, the higher the temperature climbed — right up until the 110-degree mark. I sure wished I was still sitting on the cabin deck in McCall, Idaho. Thanks for coming along on the trip! Here are the rest of the pictures. Dinner at Lardo’s with Ali and Beckam. Poor lighting for the pic, but phenomenal food. 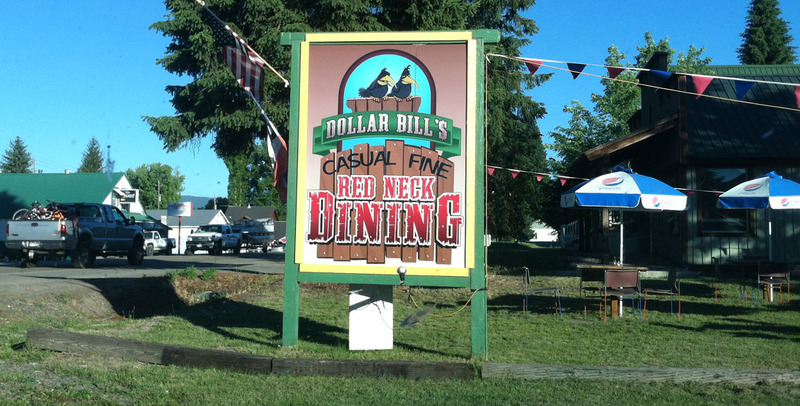 Another neat dining establishment I wish I’d had time to check out: “Dollar Bill’s Casual Fine Red Neck Dining,” in Cascade, Idaho. What a name! 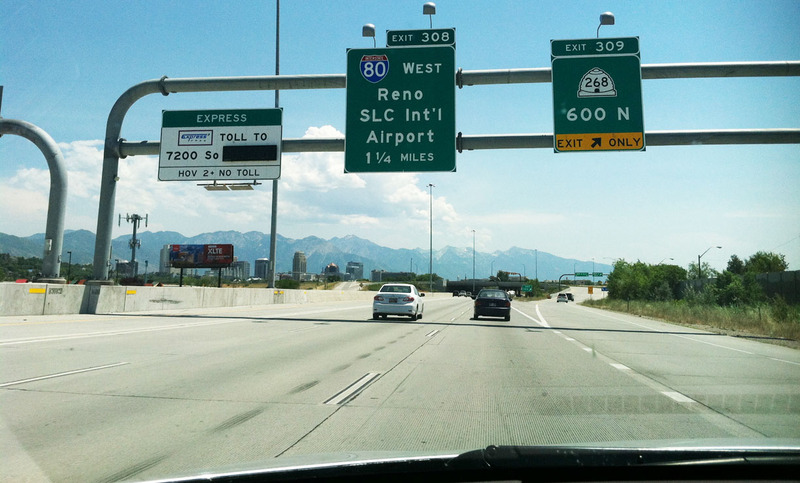 Arrival in Salt Lake City, Utah on Interstate 15 southbound. Picking up Jeremy and giving him some time at the the wheel. 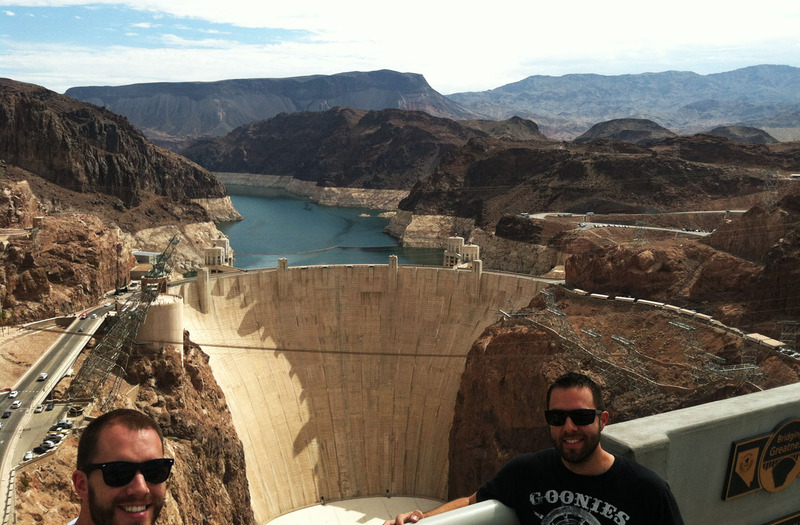 Taken near the Hoover Dam at the Arizona/Nevada state line. Total trip time & distance: 41 hours, 39 minutes and 2,521 miles since I departed last Wednesday. And that’s a wrap to the trip! Now, it’s time to get down to business and get some updates on how these cars are staying on the road. 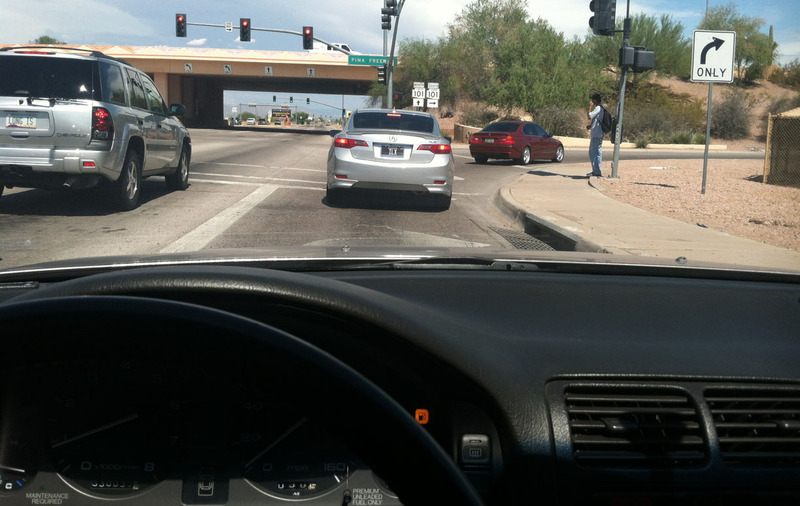 Here’s a photo while driving the Legend to get some maintenance done, and following Jeremy in my ILX. The Legend coupe is currently getting a new power steering rack, fresh spark plugs, and a CV axle boot. I’ll pick it up tomorrow. These maintenance items are in preparation for the road trip to NALM later this month in Los Angeles. 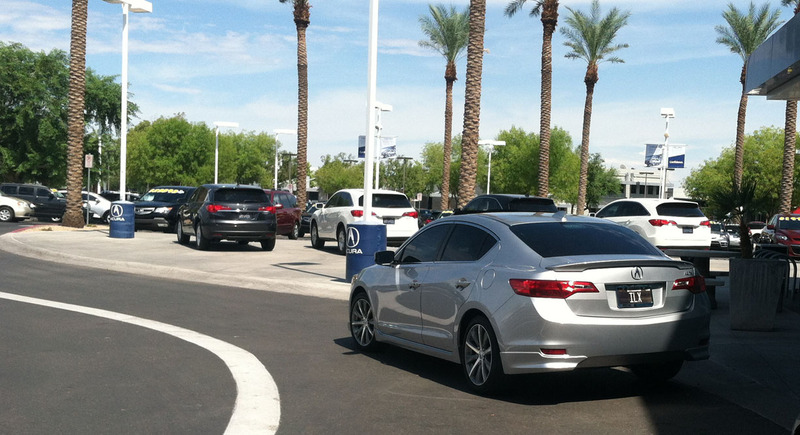 The ILX went in today for a “B1” service including an oil change with 0W20 oil, new engine air filter, and a tire rotation. It set me back $118.69. The technician’s inspection noted that my rear brakes are down to 3MM. 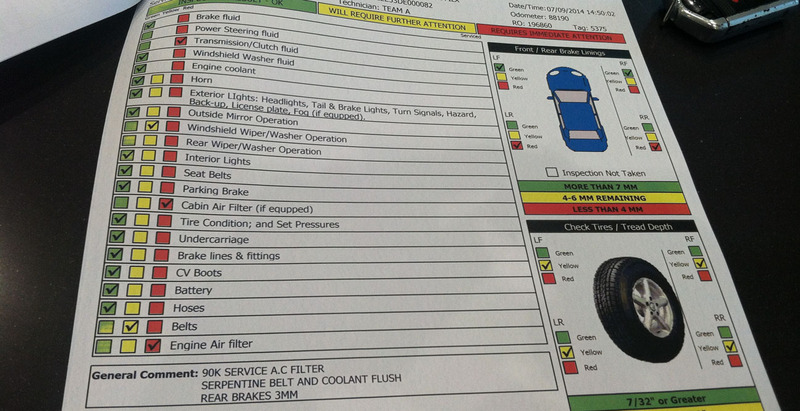 Also, I’m coming up on a 90k service interval which calls for replacement of the serpentine belt and a coolant flush. What surprised me was how far the car allowed me to drive on that same oil change. Since my last appointment on May 14th, I drove 9,274 miles on one oil change, and the car’s Maintenance Minder still told me the oil had 15% life remaining. The dealership is undergoing some renovations inside & out. 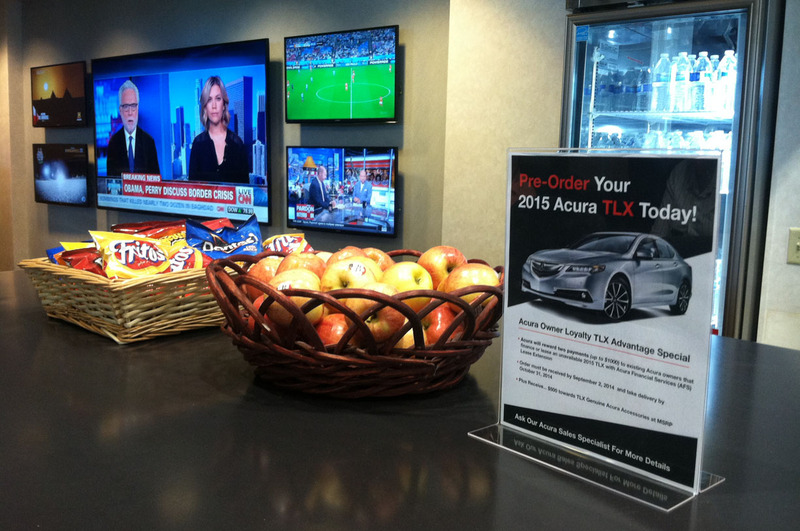 Think they have enough flat-screen TVs in the Customer Lounge? And back on my way! This entry was posted on July 9, 2014 at 4:34 pm and is filed under ILX, Maintenance, Road Trip. You can follow any responses to this entry through the RSS 2.0 feed. You can leave a response, or trackback from your own site. did you take the legend to Wes? Yes! He’s had it since Monday afternoon. It’s in good hands! My gosh, I’ve missed so much! I’m FINALLY caught up after not having a chance to read the blog since early June! I’m actually looking forward to a pretty lengthy road trip my mom and I will be taking in August. It will be from the Chicago area, to Atlanta, GA, to Mammoth Cave in Kentucky, to Springfield, IL, and back home. While in Atlanta, we are driving to Rock City Gardens, which is near Chattanooga, TN. We may also end up visiting Birmingham AL, since it’s not too far from Atlanta. What was supposed to be an 800 mile round trip road trip, has turned into a 2,500-3,000 mile road trip! Hopefully the 2006 Accord will FINALLY turn 100,000 miles on this trip! Holy cow, that’s going to be an awesome trip in the Accord! Take some pictures along the way and email them to me – I’d love to feature your road trip story. Tyson, looks like you had quite a trip! I had some catching up to do. 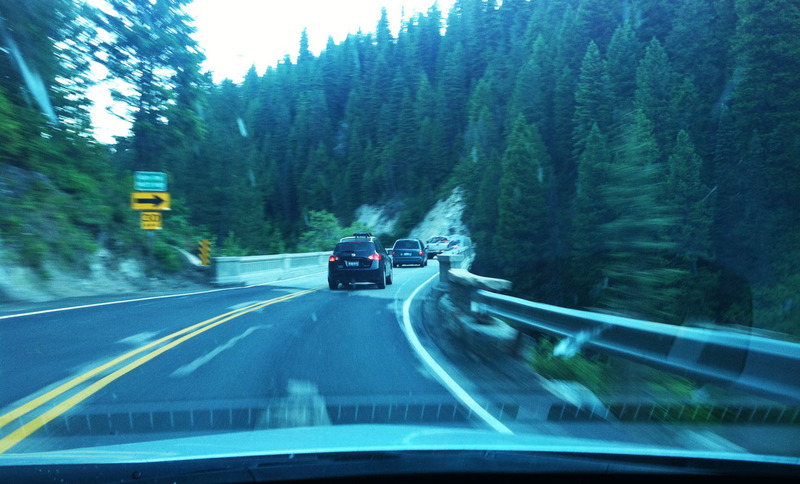 I like 4th of July…an excuse to hit the road! Loved reading through your adventures with Josh. I want to meet up with him next time I’m up in that area. (Maybe a Fall drive for both of us?) Can’t believe you covered a massive 2,500 miles! Good job keeping the Legend going strong with those maintenance items. I’m surprised they didn’t tell you the shock absorbers weren’t “shot absorbers.” lol I’m also surprised to see the brakes on the ILX are starting to show some wear. Maybe cut down a little on those handbrake turns? 🙂 Next stop: Death Valley! Haha yes, let’s plan a fall COOL WEATHER drive to make up for the fact that our cars are going to ignite in CA in about a week. Thanks for getting caught up on the blog. See ya SOON. Why don’t you just pay me $120 to change your oil, rotate your tires, and replace the engine air filter! Tyson will hate to admit it, but he prefers having me along for company over driving alone. I mean, surely the drive is more entertaining when my passenger who is 6’6″ tall is sitting on the center console, sticking his head out the moonroof and putting his legs out the window, and setting his drink cup on the roof while we are idling along in traffic on I-15. And getting truckers to honk. Oh my. Tyson and his maintenance, now there is a boat load of reading right there! Keep on trucking! Haha, yes of course! I look forward to seeing ya in just a little over a week! I might request a quick spin around the block in Six and I’d like you to test drive my GS as well.